“Look, there are things here — look, I’ve made it very clear that where I agree with the president, we will agree or where I disagree, we will disagree. But I’m going to fight like hell for Colorado, and we’ve done some good things for Colorado. So, it’s a qualified yes, but that shouldn’t surprise anyone. Just a month before the 2016 election, Gardner famously announced that he would not be voting for President Trump in the general election, but, instead, write in the name of Mike Pence. 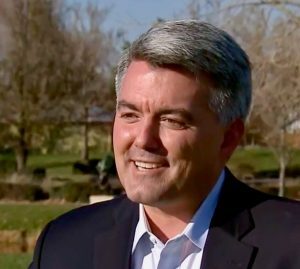 However, after working with the President in Gardner’s capacity as the head of the Republican Senatorial Campaign Committee, it has become apparent that Gardner has gotten used to President Trump. Besides, Kamala Harris and Bernie Sanders would be a disaster for America – and Colorado. This sends a clear “back off” signal to any primary opponent who may perceive an opening between the Senator and Trump supporters. How that message is read and understood is a different matter all together, but Republicans would be shooting themselves in the foot if they imagine it would be productive to drag the GOP candidate through a bloody primary match that would focus on one’s loyalty to the President.